Timelapse movies of the snowfall on Mauna Loa and Mauna Kea. Views on Mauna Loa are looking north with Mauna Kea in the distance. A Flash Flood Watch remains in effect for Hawaii Island through Sunday afternoon (Dec 4). 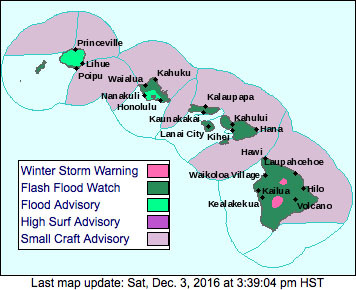 A Winter Storm Warning is in effect for Hawaii Island summits 6 a.m. Sunday morning through 6 a.m. Monday (Dec 5) for summits above 11,000 feet. A light dusting of snow and ice is possible through tonight with an additional 6-12 inches of snow expected Sunday and Sunday night. The winter conditions will make for dangerous travel via car or foot. Winds on the summits are south 15-30 mph with higher gusts. Temperatures in the upper 20s to mid 30s. Visibility is below 1/4 mile at times. A High Surf Advisory is in effect until 6 p.m. this evening (Dec 3) for east facing shores of Hawaii Island. A Small Craft Advisory is in effect for Hawaii Island windward, leeward and southeast waters and th Alenuihaha Channel until 6 p.m. this evening (Dec 3).